I have neither class nor work on Fridays, meaning I get to spend the whole day at home catching up on homework and housework after sleeping in a little bit. I wanted to cook myself up a nice breakfast with some eggs and leftover lemon-oregano emulsion. However, as of Friday, Zak and I had not been grocery shopping for quite some time. The bread was moldy and we didn’t have any milk in the fridge, so both eggs on toast and baked eggs were out. After peering forlornly into the refrigerator for awhile, I noticed a package of tortillas far from expiration and a package of Chinese chives Zak had recently purchased from the Asian market. Perfect! Some sunny side up eggs with a healthy drizzle of lemon-oregano emulsion and fresh, oniony chives over a warmed tortilla were the perfect breakfast. The lemon-oregano emulsion tastes a lot like a traditional hollandaise sauce, which of course is the perfect accompaniment to runny eggs. 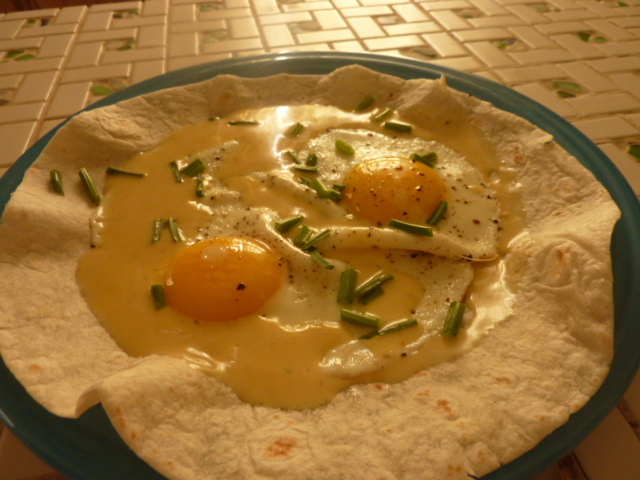 The tortilla provides a bit of substance, soaking up some of the egg yolk and sauce. Finally, the Chinese chives have a very similar flavor to traditional chives, though a bit more pronounced and definitely with more texture to them. Regular chives can certainly be substituted, but use more of them because their flavor is toned down a bit from Chinese chives. I love love loved the flavor combinations in this dish, and it’s pretty, quick, and easy to boot! In fact, this is so easy that it barely qualifies as a recipe – basically, fry up some eggs and put everything on a plate. In a medium non-stick pan, melt butter over medium heat. Carefully crack eggs into the pan. Season with salt and pepper. Cook 4-5 minutes until whites are set but yolks are still running. Place warm tortilla on a plate. Carefully side eggs out of the pan and onto the plate, being sure to check with a spatula first that they will easily slide. Top with chives and lemon-oregano emulsion. Serve immediately. On Wednesday while I was at school, Zak let me know that he had taken a trip to Whole Foods to pick up some fish and after bs-ing a little bit with the fish monger while purchasing this branzino, the fish monger threw in some free salmon steaks. SCORE! 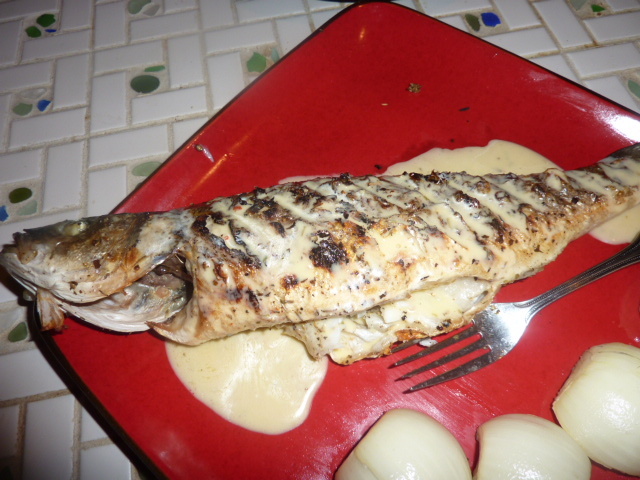 He offered to cook up the salmon steaks on Wednesday and gave me the task of preparing this branzino on Thursday. It was nice to have a whole day to brainstorm. I knew I wanted to throw the fish on the grill. This Mediterranean fish absorbs smoke beautifully, and the skin crisps up in such a way that I can’t describe its deliciousness. I also wanted to pair it with lemon somehow, but was bored of simply stuffing the cavity and squeezing a few wedges over. Instead, I decided to prepare a lemon sauce. My new immersion blender that my sister-in-law got for us as a shower gift is super handy for whipping up sauces and emulsions, so I decided to make a lemon, Dijon, and oregano emulsion with a touch of mayonnaise for extra creaminess. This turned out great. Though simple, the smokiness of the sweet-fleshed grilled fish paired perfectly with the lemon-y, creamy emulsion. The emulsion on its own was delicious, and I was happy to have leftovers while making breakfast the next morning – it makes for an excellent substitute for hollandaise, so I’ll post a recipe I made with it soon! Preheat a grill, either charcoal or gas. Using a brush, brush fish, inside and out, with olive oil. Liberally season all sides and center cavity of the fish with oregano, salt, and pepper. Place on preheated grill and cook 7 minutes per side until flesh is opaque and flakes easily. When flipping the fish, carefully separate the skin of the fish from the grill and flip in one fluid movement. Cover grill once flipped. Combine lemon juice, mustard, mayonnaise, oregano, crushed red pepper flakes, salt and pepper. Using an immersion blender, food processor, or whisk slowly drizzle in olive oil while whisking/blending. I was definitely missing the CSA produce after not picking up our share last weekend. So I am double excited for this week’s share. 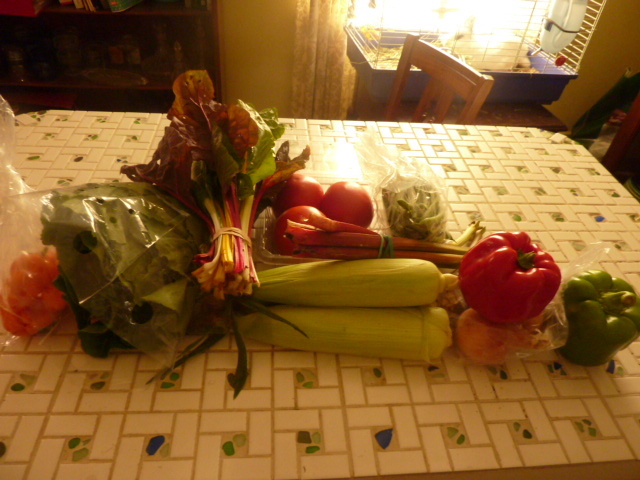 Included are Yummy Orange peppers, a head of lettuce, some wonderfully colorful rainbow Swiss chard, three ears of corn, three big tomatoes, a few stalks of rhubarb, a bag of green beans, three little onions, a red pepper, and a green pepper. Because we had two weeks to get through the produce from week five, we ate pretty much everything. I ended up tossing some lettuce from a few weeks back that was wilted. I still have miscellaneous onions and potatoes in the pantry, of course, but those last for ages so I don’t really consider them “leftovers.” We didn’t eat all of the cantaloupe, though most of it made for a great snack, as I cubed it and placed it in the refrigerator in a big tupper ware to munch on when we felt like something sweet. I made agua fresca with the watermelons from weeks four and five, which despite the large amount was very quickly consumed because it’s so, so good. 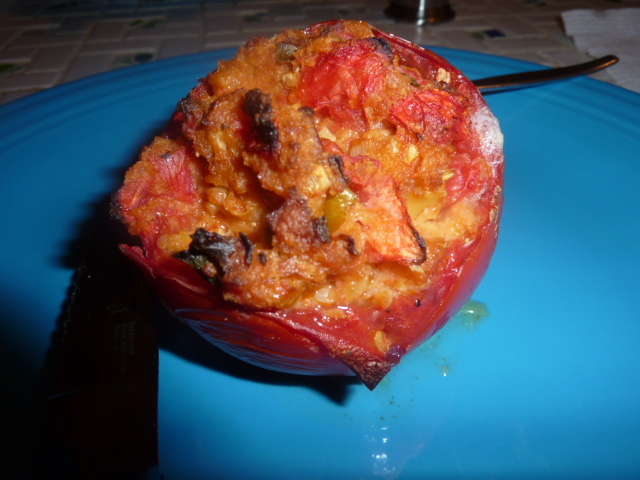 The mushroom and ricotta stuffed Hungarian hot peppers in fresh tomato sauce used peppers and tomatoes from week four of the CSA, and the freshness of the ingredients really elevated it to a higher level. I made a few charred pepper sandwiches out of the green pepper, since they are one of my summer favorites. To be honest, I don’t have an extremely clear picture for how I’m going to use this week’s produce – and now that I’m back in school and working, I need to get myself organized! I know for sure that I want to make crispy roasted green beans, since I so miserably failed by burning them the last time and I’ve been craving them. 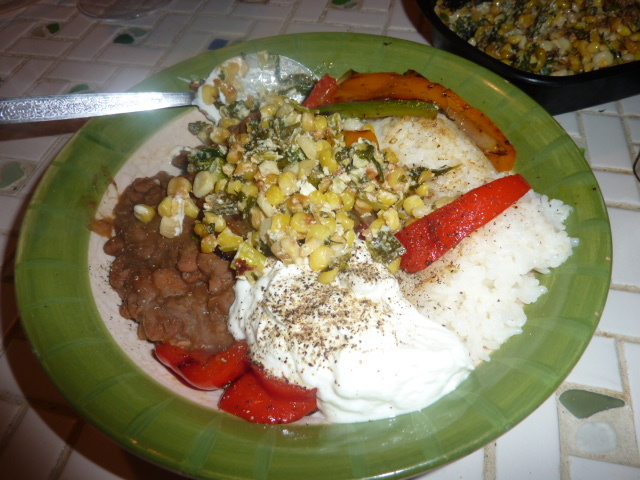 I’m considering making a sort of vegetarian burrito bowl with some of the peppers, topped with a play off of the esquites I made awhile back. I am certainly going to make a big chopped salad to have for lunch a couple of days this week and use the rhubarb as part of a tangy vinaigrette. As far as food supplies go, we’re running on empty. Because we got married on Saturday, neither of us picked up the CSA (we had bigger things on our mind, I suppose!). We haven’t been to the grocery store to restock our pantry in awhile, and while Zak made a quick stop at the Asian market for a few essentials, it’s slim pickin’s. What we did have was gorgeous heirloom tomatoes grown by my dad, some bread, and a variety of cheeses. Okay. Stuffed tomatoes it is. These are great because they are entirely customizable. Any bread will do. Don’t have scallions? Shallots, white onions, yellow onions, or red onions are fine. Don’t have beech mushrooms? Button or baby bella will do. No chimay (a full flavored Belgian cheese washed with Belgian beer, imparting a robust, hoppy bitterness)? Use mozzarella, Swiss, whatever melt-y cheese you have on hand. Simply mix together the ingredients, slap them in a tomato, and bake. We both really loved this. It was light and tasty, but substantial enough to work as a simple, light dinner. It would also work beautifully as a side dish with chicken. The top is crunchy, the inside silky and bursting with pockets of melted cheese. I particularly enjoyed the chimay cheese because it melts beautifully and has a very assertive, unique flavor that made this feel special. Carefully cut off the top 1/4″ of the stem side of the tomato. Using a spoon, carefully remove seeds and inner flesh from the tomato. Roughly chop and set aside. Liberally season with salt and pepper. Set aside. In a medium non-stick pan, melt butter over medium heat. Add scallions and mushrooms. Sauté until tender, 3-5 minutes. Add bread crumbs and cook until lightly toasted, 3-5 minutes. Add tomatoes and stir to combine. Cook until liquid is mostly evaporated. Use a big spoon to stuff the tomatoes. Place in a snug casserole dish. Place in oven and cook 30 minutes until stuffing is golden brown on top.